I love the this quote because it exposes perfectionism for what it really is: an exercise in futility. Of course none of us never does anything wrong. To avoid mistakes is impossible, and yet so many of us would rather try than take the path of self-forgiveness. I messed up this week. It wasn’t a huge deal, but what I did impacted another person, and I was immediately struck with intense guilt, as well as anger at myself for having indulged the controlling tendencies I’m trying so hard to soften. In this particular situation, it was my need to “fix” that got me into trouble, my habit of pouncing on potential problems and managing them aggressively. In trying to do what was right, I ended up doing what felt foolish, and wrong. In my effort to be proactive, I created difficulties, rather than smoothing them over. As I sat with these facts, I remembered Gilbert’s quote. I gave some thought to the egotism that’s embedded in being a perfectionist. Most of the perfectionists I know–myself included–would admit that to err is human. Yet we make ourselves the exception; we specially select ourselves to be the only people we know who never screw up. It’s crazy, really. I say this with an understanding of what drives so many of us to aim for flawlessness in the first place: demanding or painful childhoods, socially reinforced expectations, our own insecurities. I can’t speak for all perfectionists, but for most of my life I’ve believed that if I can just keep doing everything right, I might be able to escape the sense of my own rottenness that has followed me around for as long as I can remember. You can’t outrun yourself, though–at least not in my experience–which brings me back to Gilbert’s choices: either you keep aiming for the impossible, in which case you’ll need to constantly fend off disappointment and disillusionment, or you learn to forgive your mistakes and let them go. I’m aiming for the latter these days, no matter how ill-equipped I sometimes feel in doing it. Part of my struggle this past week was to realize how far I am from being able to practice self-forgiveness with ease. I thought maybe this mistake would be the one I could regard with humor and perspective, the one I could leave behind without a struggle. Instead, I experienced the usual onslaught of guilt, the familiar wave of anxiety that comes with my fear of being perceived as a failure. I guess I can acknowledge the fact that, rather than trusting in these feelings, I was able to question their veracity. I didn’t feel their impact any less, but I may have bounced back more quickly than usual, because I took the time to question a thought process so unforgiving that it that shuts humanity out. Sometimes we do things that we regret. We hurt ourselves and others. We speak without thinking, or we speak with the intention of harming. We lash out. We act too fast, or without thinking. 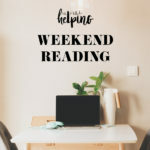 It’s all part of the big tapestry of being human, and while it’s OK to have regrets–to assess our actions critically and learn from them–it’s not very fruitful to get swept into an endless vortex of self-loathing. I’m starting to regard self-forgiveness as one of the most essential human capacities, a prerequisite for resilience and looking forward. I see that it’s an important part of being humble, of being able to accept that you’re as fallible and messy as the next person–no better, but also no worse. I have a long way to go with it, but I’m practicing each and every time I stumble. I held in my hands one of the prettiest fish I’d ever seen. He was scared and oxygen-deprived, and I’d torn almost his entire bottom lip right the way around. Fish don’t have arms or legs to help them get by. All they have is their lips and mouths to gather food, build nests, and protect their young. Damaging these parts of their body can be fatal, even if they are swiftly released. This is an incredible example of remorse and resilience coexisting. What Maio regrets isn’t small or inconsequential; it’s a decade’s worth of actions that he now considers unacceptable. Yet he’s able to process the regret in such a way that it doesn’t cripple him; rather, it galvanizes him to do things differently from now on. Maio goes on to describe his newfound understanding of fish sentience, his admiration of their intelligence and capacity to feel. He notes that his appreciation of the ocean and love for its inhabitants “has grown tenfold since I stopped treating them like disposable playthings.” In sharing these words, he’s both making himself vulnerable and also speaking out against a “pastime” that is probably still cherished by many of his family and friends. He’s taking a big risk. I hope he can take consolation in the fact that his words will undoubtedly compel someone else to look at fishing in a new way. Self-forgiveness can take a physical form, too. It can involve learning to forgive one’s own body for not neatly conforming to expectations. Ashley Ford’s essay on buying a crop top at her heaviest weight is about a lot more than fashion. It’s about learning–through lots of struggle–to accept her body without qualifications or conditions. And it’s pretty great. 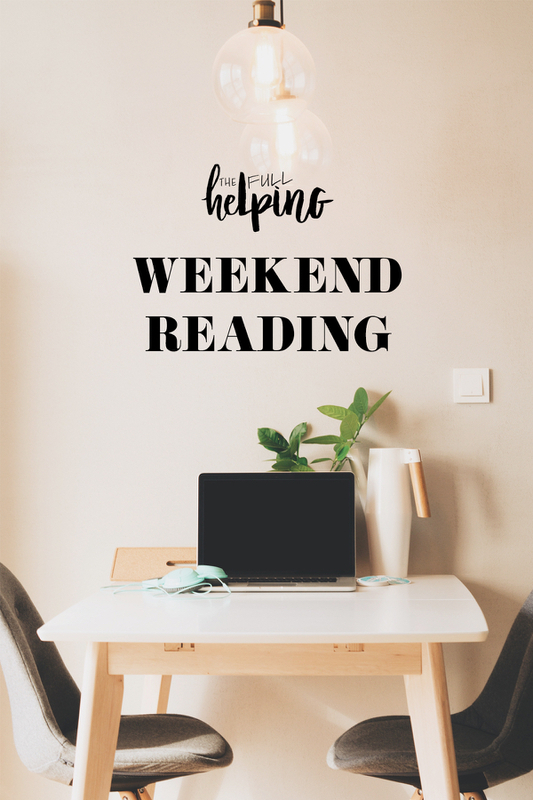 I hope you’ll enjoy the reads. But first, here are some of the awesome recipes that caught my eye this week. 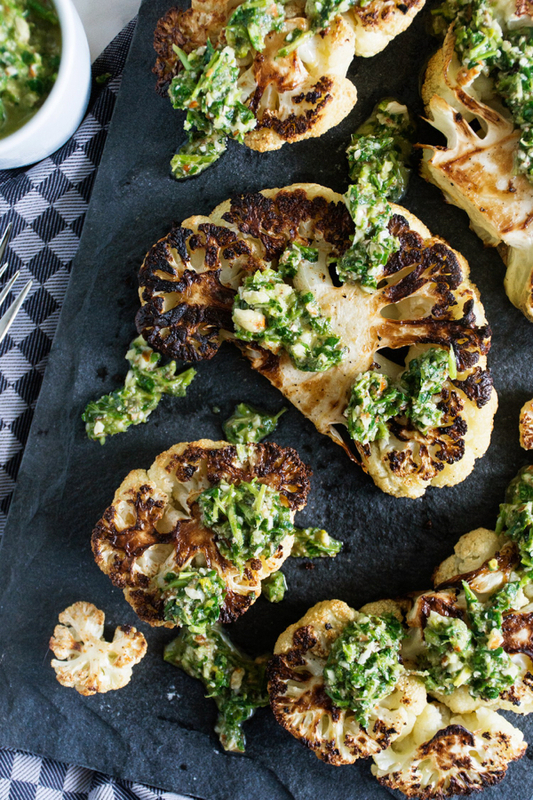 First up, juicy cauliflower steaks from Finn of Port & Fin. I particularly love the idea of an almond chimichurri to spoon over them! 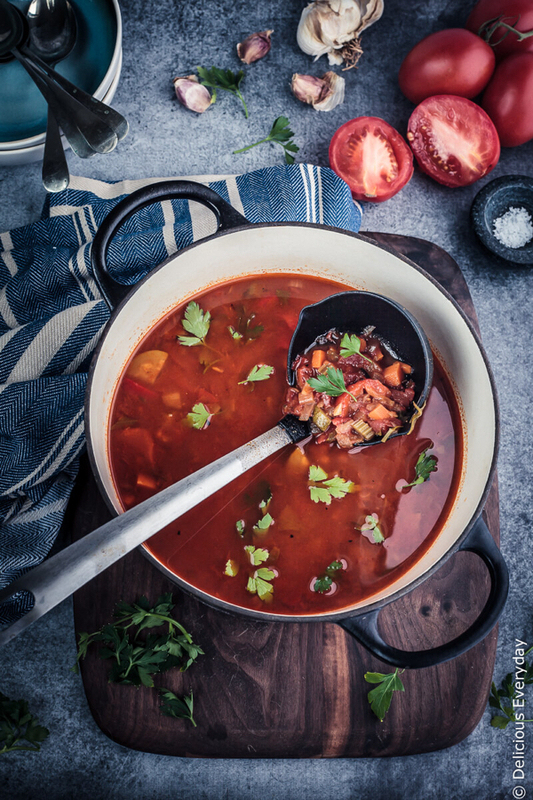 I can’t get enough soup at the moment, and Jennifer’s smoky Spanish tomato soup just topped my list of recipes to try next. It’s packed with veggies, and I’m a sucker for anything with smoked paprika. 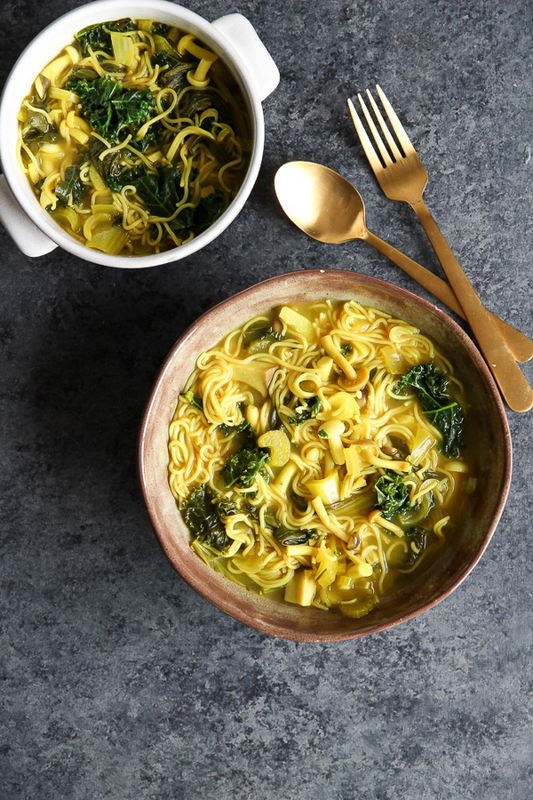 More healing foods for winter: Molly’s beautiful ginger mushroom kale noodle soup. I love how the addition of turmeric gives this one a golden color. Tis the season for citrusy winter salads. 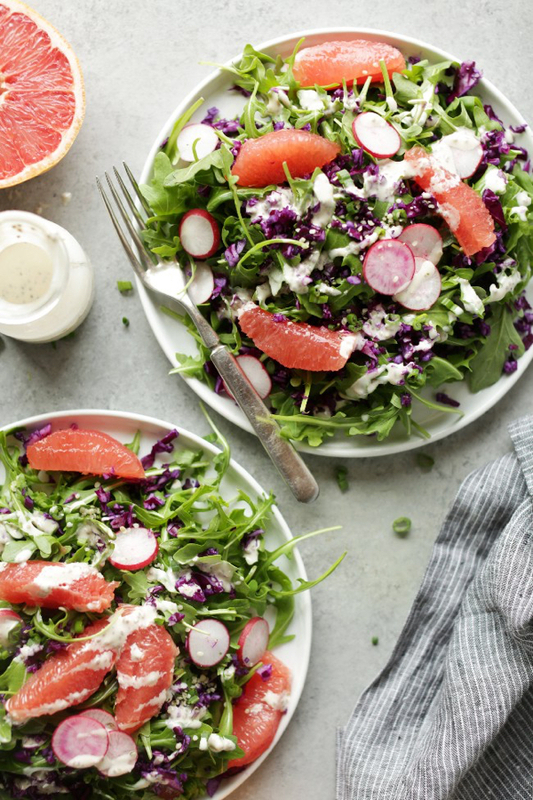 Sierra’s winter bliss salad features grapefruit wedges, arugula, and an ingenious chia tahini dressing. Finally, a little comfort food for you. 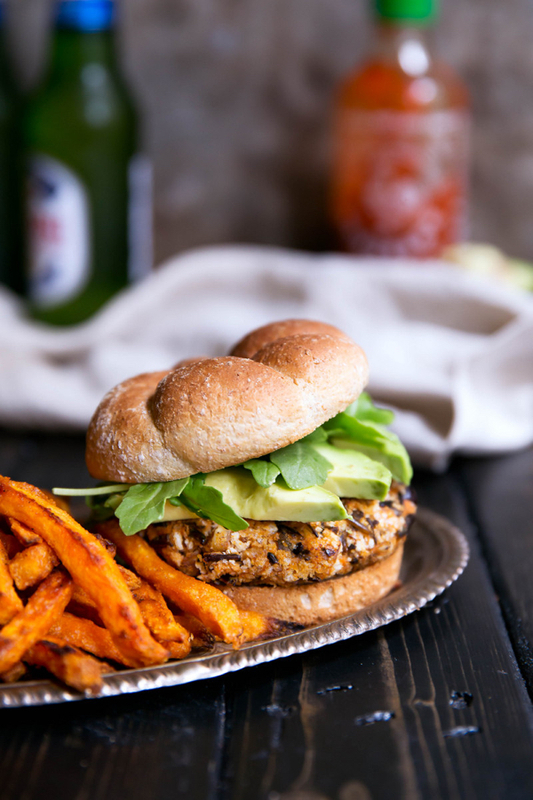 Monique’s curried sweet potato wild rice burgers look delicious, and I love the unexpected incorporation of cranberries for a little savory/sweet action. 1. Dan Maio looks back on the sport of fishing–and shares why he’ll never cast a line again. 2. As many of you have probably heard, Ringling Brothers is permanently ending its performances, which is a victory for the elephants, lions, tigers, camels, donkeys, alpacas, kangaroos and llamas that it holds captive for entertainment purposes. The organization has pledged to find homes for all of the animals. 3. Also on the topic of animal rights, Mark Bekoff shares an excellent and illuminating article in Psychology Today about the emotional lives of chickens. 4. An inspiring green recovery story from Taylor Wolfram, a vegan RD and passionate body acceptance advocate. Taylor always has insightful things to share about health at every size on her social media channels, and I really enjoyed reading about her personal journey to making peace with her body. 5. Finally, and on a related note, Ashley Ford on body acceptance, body love, and the power of crop tops. Here’s to cultivating our capacity to celebrate our bodies and ourselves. Here’s to forgiveness, and here’s to peace. Have a great Sunday evening, all. Wonderful round up this week! Thank you for your comments on perfectionism. I struggle mightily with this too and really relate to how you’re expressing your evolution of thought on the topic. I try to tell myself to be as gentle with myself as I would be with a friend. If I wouldn’t treat a friend who was struggling or had “failed” harshly, then why should I be any less loving to myself? Thank you also for the fish article. I fished once at summer camp as a very young child and hated it. Instinctively it felt so wrong. Fishing wild fish for food purposes (as opposed to sport) is still something I struggle with. I was a long term vegetarian (since 98) and strict vegan for about 10 of those nearly 20 years but relatively recently added small amounts of wild fish and shellfish to my diet for personal health reasons. I keep a vegan diet outside of that and my eating is still about 90% vegan. I still struggle mightily with the ethics of that choice and this article again pushes me to consider a return to strict veganism. That is a very thought provoking tweet from Elizabeth Gilbert. I certainly could work on my own self forgiveness in many different aspects of my life. I think we’re all way too hard on ourselves these days.